Are you failing in your sales conversations? It’s time to take off the stench of failure and learn how to use the proven processes for connecting, communicating and effectively selling. 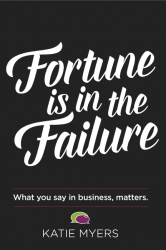 “Fortune is in the Failure” gives you the expertise for communication strategies that lead to successful, stress-free sales conversations. Grab your favorite libation and learn how there IS fortune in the failure! Your clients will thank you for it!